Alright, so I never try to be one to promote fearmongering, but I’m watching the news this morning and one of the many stats being hyped is 23%. Of what you ask? Percentage of Americans with Diabetes. According to the CDC, approximately 24 Million Americans have diabetes (which is up 3 million over the last 2 years) and another 57 Million Americans have a condition called “pre-diabetes”. Basically saying these pre-diabetics are well on their way to developing diabetes, they just haven’t hit the “official” diabetes numbers yet. Like I said, I don’t like to promote fearmongering, but…..I don’t doubt these numbers for a second. Yes, America is the land of the over-diagnosed and the over-medicated. Yes, the first thing we do as a nation is get a pill or some other “quick-fix” for whatever ailes us. As a nation, are we getting more out-of-shape and less healthy? Damn right we are. The ridiculousness of the whole thing is that it’s actually very easy to avoid. It takes a little knowledge and some will power. Where do you start? Start by educating yourself. There’s lots of information out in cyberspace and a bunch of it is complete crap. Make sure your source(s) are reliable. This blog is a great place to start because we have some programs, meals and nutrition information for free. Take a look at the links on the right navigation bar of this blog and you’ll see other great sources for nutrition, training and products. Next, formulate a plan. Work out a fitness schedule and weekly nutrition plan. If you can get your calories under control, you’ll be amazed how fast you can make body composition changes. Figure out how many days a week you’re going to exercise, either in the gym, outdoors or in the comfort of your own home. What if I don’t have access to a gym? You don’t need a gym to get your heart rate up, your sweat flowing and your fat burning. This is where the whole “will power” element comes into play. Just get up from your chair, out of your house or office and get moving. If you absolutely can’t get out, spend a little bit of money and get some gear that allows you to train at home. Honestly, it doesn’t take much. You don’t need to have hundreds of movements to make a program from. In fact, most of the fitness professionals I know rely on a very small number of exercises that they cycle through. Couple that with some basic cardio training and you’ll be well on your way. Don’t be one of the 23%. Don’t become one of the 23%. Don’t even think about the number 23 (sorry Michael Jordan and Jim Carrey). This is very brief information, I know. Trust me, I could write for weeks and not get all the information out. With that said, got questions? Post them to comments. We’ll answer you back. If you’re serious about getting in shape or taking your fitness to the next level, go to www.hybridfitness.tv and sign in to the box on the upper right. It costs you absolutely NOTHING, we’ll send you free fitness tips on a regular basis, we DO NOT SPAM ANYONE and we’ll let you know when Hybrid launches. You can’t go wrong. There’s such an abundance of misinformation in the world, especially when it comes to fitness. It’s not often that I actually agree with information that I read from some of the major internet news sources like Yahoo and MSN. But the piece below is a copy of an article that appeared today on Yahoo’s main page. The information in the article is not very indepth, but they get the idea across. Bottom line, interval training will get you better results for overall calorie burn and boost your cardiovascular endurance much faster than with steady-state exercise. 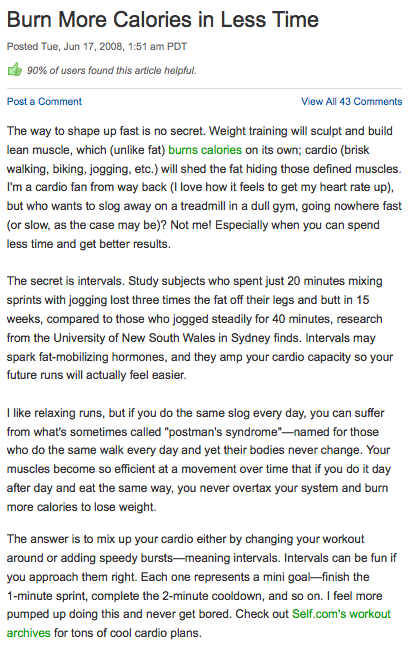 Check out some of the other articles we’ve posted about interval training on this blog. Try them for a couple weeks and I guarantee you’ll be believer. The article was written by Lucy Danziger, Editor-In-Chief of Self magazine. Today I am talking about the most fundamental component of training there is, the rep. If you want to achieve maximum success from your training as well as enjoy continued progress over the long term then how you execute each rep is very important. Below I will outline the rules I use when teaching people how to strength train properly. 1. Raise the weight in a smooth and deliberate manner. Avoid sudden or jerky movements. Eliminate the use of any momentum. 2. Pause momentarily in the muscles fully-contracted position. 3. Slowly make the transition from raising the weight to lowering the weight. Do not suddenly drop the weight. 4. Emphasize the lowering of the weight. The muscles that raise the weight are the same muscles used to lower the weight. 5. Raise and lower the weight through the full range of motion* provided by each exercise. Always move through your maximum range of motion provided that you are in complete control of the weight at all times and you are pain free. I recommend that you raise and lower the weight taking roughly 3-5 seconds in both the positive and negative phase. This means that each rep will take between 6-10 seconds to complete. For absolute beginners or those coming back from a lay-off or recovering from injury I recommend starting with the slower speeds (5 seconds up, 5 seconds down). To assist beginners with their learning of these slower style repetitions I will often use a metronome. I set the metronome for a sixty beat count (one beat per second); this way they can easily match their movements to the cadence set by the metronome. If you have never tried using slow controlled movement when lifting weights you may be in for a shock. First you may find you have to drop your poundage on many exercises as this low force method will increase the tension the muscles experience. Second be prepared for a serious case of the DOMS when training to failure in this style. Remember how you execute each repetition is the most fudamental aspect of your strength training. Train smart, train safe and reap the rewards that strength training has to offer. As a side note, there are other training methods, such as Olympic weight lifting and kettlebell training, that specifically require fast, explosive repetitions. We’re not discounting those methods in the slightest. In fact, we personally train this way quite often when using strength implements to enhance metabolic conditoning. Makeshift Gym + Intervals = ??? Makeshift gym + Intervals = Success! Thought I’d share another success story for you. I’ve got a client who, together with her husband, make a very comfortable living. Without going into detail about their financial situation, suffice it to say they live in a million-dollar home and drive luxury cars. Why not, they’ve earned it! They could easily afford memberships to the ritziest clubs in the city. Instead, they opt for a different situation. The wife trains with me a couple times per week. We begin most sessions with a short warm-up run, followed by a set of high-intensity sprint intervals. We run back to the house and hit the “gym”. The gym is a small section of the garage with a handful of equipment. Literally, it consists of a sandbag, a kettlebell, a medicine ball, a couple sets of dumbbells and a selection of sportbands. Why work out in her garage when she could be working out in style and comfort at a club? Simply because she’s only focussed on results. Who cares how big a gym’s pool is or what kind of bottled water the sell (overcharge for)? If you’re goal is to get in shape, it’s not about where you train, but how you train. So the bottom line is, it’s not where you train but how you train and how HARD you train. You can get instant gratification from your training, but it’s always going to be directly related to the work you put into it. If you train hard and train consistently, you will succeed. If you need to hire a trainer to keep you on task, do it, but make sure you’re getting the most out of the time. If you don’t feel like you’re being pushed hard enough, speak up…it’s your money, after all. P.S. : If you haven’t yet, take a look at Iron Woody Fitness. I can’t say enough good things about them. I purchased a few sets of bands several years ago and I still use the same bands today. Trust me, they’ve seen their fair share of use, but they continue endure the punishment I throw at them. That goes for the bells I’ve purchased as well. Bottom line is, they have great products, superior customer service and rockin’ prices. Yes, we’re an Iron Woody affiliate and proud of it. Here is a little midsection circuit I use quite often with my clients. Depending on the current abilities of the individual in question I may use this as part of a dynamic warm-up or even as the main focus of their mid-section training. This series may be easily done using just ones bodyweight or enhanced slightly with the addition of a stability ball. As with most of my training I may do these movements for time or repetitions. Either way I strive to have the execution performed with smooth control over the greatest range of motion possible. In the video you will see the circuit performed using a small (45cm) stability ball. These same basic movements can easily be done using only ones body weight.